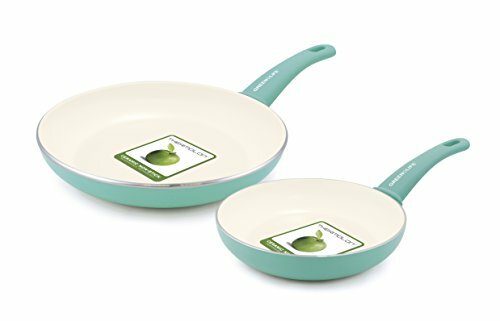 The GreenLife Soft Grip Ceramic Non-Stick 7″ and 10″ Open Frypan Set, Turquoise makes the perfect addition to any kitchen. The high performance Thermolon ceramic non-stick coating is long lasting and easy to clean, made without PFAS, PFOA, lead or cadmium. The turquoise aluminum reinforced body adds a touch of style to your kitchen, while the matching soft-grip handles provide much-needed comfort. The dishwasher-safe construction makes cleanup a breeze. Finally they should be allowed to cool before washing I’ve been using these every day for the past several months and I don’t have any problems. It’s important to read the directions carefully to know how to properly take care of ceramic cookware. Certain cooking oils cannot be used on this cookware. Sprays should never be used. Also heat should not be turned up past medium. Finally they should be allowed to cool before washing.